The last vestiges of glitter remain in the crevices of my wood floors, but aside from that I’m ready for Christmas, at least on the first floor. As if I didn’t have enough to do I tore my studio apart, the second floor of our house looks like the aftermath of a tornado. I know I’m just a little crazy, but this has been such a bad year that I am determined to head into 2014 ahead of the game, and set up for success. I started this blog/project carrying some very heavy psychological baggage, I am two-thirds of the way through, its time to move forward. I’ve subjected anyone who reads this blog to my working out my artistic issues, and quite a few personal ones as well. Not something I set out to do. Actually I don’t know what I started out to do other than to use up art supplies. I honestly didn’t think about it prior to heading into it. I guess I thought I would create art and talk about it. I never dreamed that my life would change so much, or that I would find myself pouring my heart out to the vast unknown. I think at this point maybe some of you know me more than you want to. There have been nights when I have gotten on a rant on something completely non art related only to stop myself and backspace it into oblivion. I have a steel rod of self-righteousness that runs straight up my spine. It can be used for both good and evil, but when I get upset about things it is bad, really bad. I obsess. I try not to let my obsession spill out onto these pages. I need to redirect my efforts. I’ve mentioned selling my work in the past, but haven’t bitten the bullet as of yet. I began the steps to rectify that tonight. I opened up a second Facebook account for business, a place to tie this blog, my etsy account, and my pinterest all together . The next step for me will be some serious self counseling for separation anxiety. I don’t like to be separated from my work. It needs to be done. I was hoping that over the course of this project that I would produce enough art that I wouldn’t take it so hard when one left the nest. Unfortunately that hasn’t happened. I still have trouble letting go of my babies, but I want and need to contribute to the care of my family. Sometimes I find myself feeling sad, wishing I could go back and tell my younger self to go for it. To recognize what a gift I have and to do something with it. These days I do a lot of talking myself out of feeling old and regretting I didn’t get a handle on things sooner. There’s no going back, and quite frankly this is a year I would never want to revisit, with one exception, my daughter’s wedding. Seeing your child be so happy makes the separation just a little better. I’ve been crafting for weeks and not putting forth my best work. Time to restart the project. I decided that I need a little back to basics. I had hoped to have more time to paint today, but cleaning all that fairy dust takes time. In the end I decided to just do some drawing. 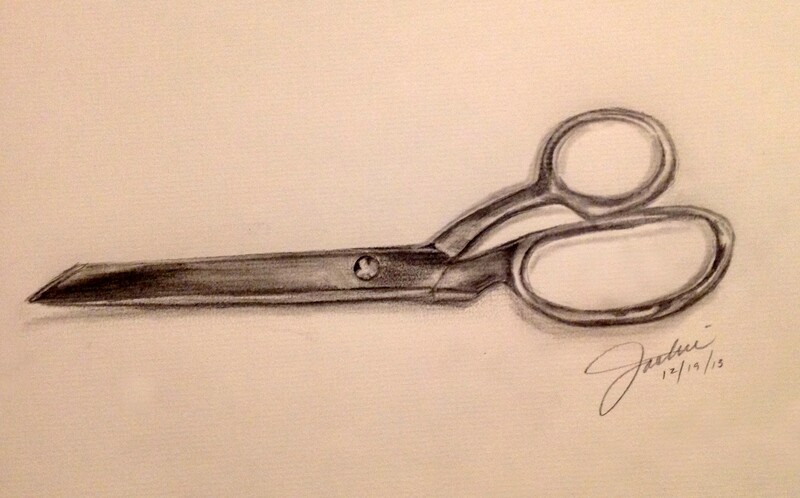 My scissors, as if I hadn’t seen enough of them in the last few weeks. Maybe its symbolic, time to cut out my nonsense…get it? I know, I should have quit while I was ahead. I spoke the other day of not quite understanding inspiration, what makes one idea or subject stand out more than another, why one photo calls to me more than another. That isn’t the case today. A friend of mine posted a photograph of his son and a friend on his Facebook page. 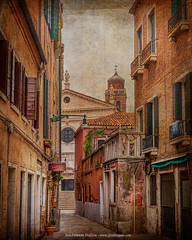 From the moment I saw the photograph I wanted to paint it. I actually had turned to Dan and said, “You know what this is? 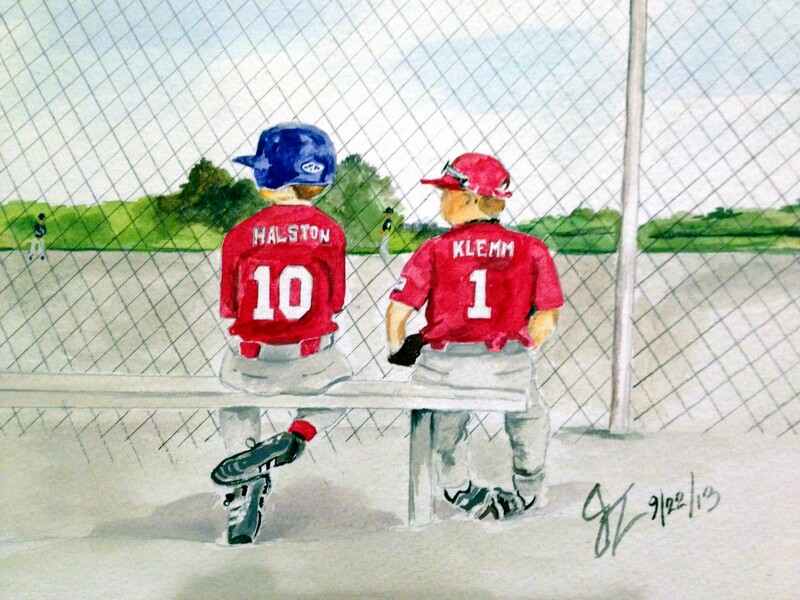 It’s a painting, a watercolor painting.” My friend labeled it, “Best buds on the bench.” I love the photograph, and I love the label. There is a nostalgia that emanates from this photo, an innocence that these days is too easily lost. As I said, I know why I wanted to paint this one. Mike, thanks for permission to paint your wonderful photo, for giving me inspiration, and I hope Ryan and his “Best Bud”, remain that way for a very long time.